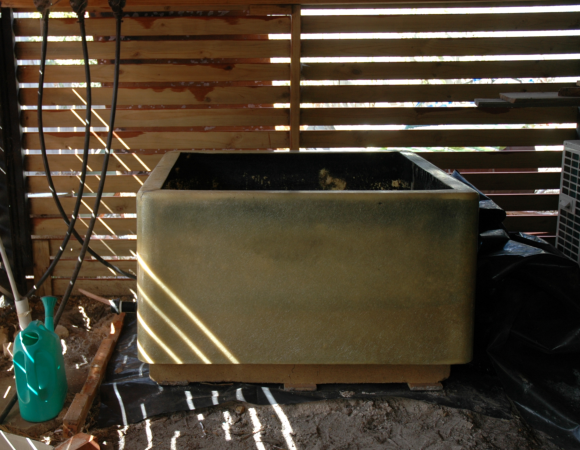 Stage One of the Aquaponics project. I leveled out the ground and compacted the sand. Made sure it was relatively even and then positioned a sturdy wooden pallet in place and put the fibre glass tank on top. The timing was somehow spot on as the fish pond began to lose its water level and I suspect it has a leak so I have emptied it and placed all the goldfish in the tank with the nearly ready to harvest water chestnuts. The other bonus find was the many marron that were lurking at the bottom of the pond. They have probably been in there about six months I think – as well as the yabbies – but not a LIVE yabby to be seen anywhere. Just a few remnants of shells and claws. Obviously marron food! There were also about twenty to thirty smaller marron – an inch or less, some even 5mm in length and all up about 15 marron 3 inches or longer. I even found a dragonfly nymph which I have not encountered since my childhood playing in and around lakes in Perth. 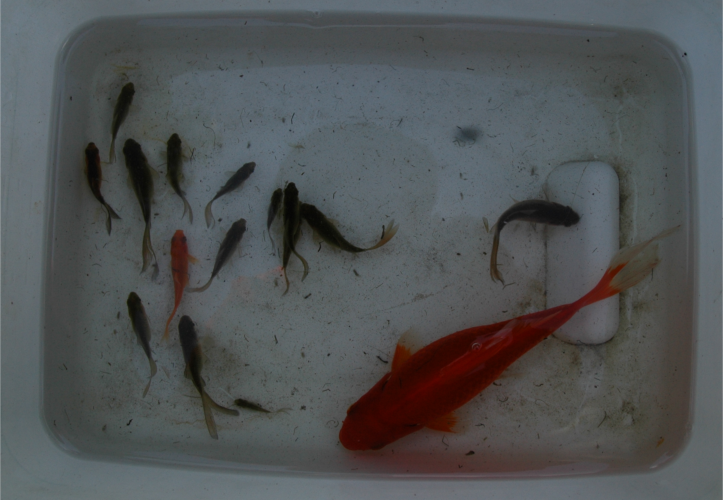 At the moment we have three large goldfish and many, many young ones which will be used for various projects around the place. Some will go back into the pond when ready, others will be used for the setting up of the aquaponics project and others may be transferred to another water garden idea I have. The problem in the meantime is housing the many marron so they are not in each others space while the pond is out of action – and I don’t really want them in with the fish after losing one of our larger ones to a bad marron attack.